A dirt road about 500 meters from Gaza's border with Israel — home of Kafa Ibrahim al-Najar, a 34-year-old father of two — was unusually quiet Tuesday morning. 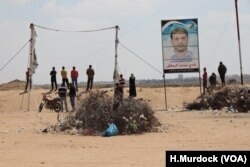 Between their house and the heavily guarded fence is a protest camp that often is packed with demonstrators. "Today is a silent moment for the people who died," al-Najar said. On Monday, 58 people died and more than 2,700 were wounded in Gaza protests, according to Palestinian officials. But by late Tuesday afternoon, many funerals were over, and protests once again were in full swing. 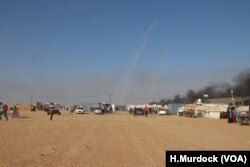 Black smoke billowed in the wind, mixing with white tear gas that rained down from drones. The crowds were much thinner than the day before, but the gas was just as thick. 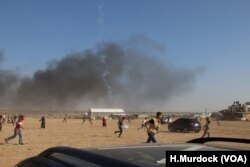 Tear gas rained down from drones every few minutes at a protest in Gaza, May 15, 2018. The protests Tuesday marked what Palestinians call the "Nakba," or disaster, the anniversary of the expulsion of Palestinians during the 1948 war and the continued rejection of their "right of return." It's a key sticking point in peace talks between Arabs and Israelis. "We won't rest until we return to our homes or the last drop of blood is spent," said one man on crutches, shot in the leg the day before. 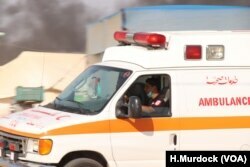 Ambulances blared through Gaza protests camps on Tuesdays despite thin crowds, carrying wounded protesters to hospitals in nearby towns, May 15, 2018. Officially the end of the more than monthlong "March of Return" protests, many demonstrators here said they planned to continue rallying for another month. "If you are living in between a ditch and an enemy, what else do you do?" said al-Najar. "Do you throw yourself in the hole, or move toward the enemy?" Hundreds of thousands of people were displaced during the 1948-1949 Arab-Israeli War, and millions of their descendants are now refugees in the Palestinian territories and neighboring countries. Young men stare out at the border of Israel, where tanks and military points surround the Gaza Strip, May 15, 2018. And despite the fact that more than a half century has passed, many Palestinians still have documents demonstrating that their family's land ownership has been long lost. "People are tired. They want to go back to their country," said Selma Hamdan al-Najar, Kafa's mother, who was born in the 1950s, a few years after her parents fled their home. The al-Najar home by the border in Gaza is barely livable because of the danger, she said, and no one will buy a home in a place so often the sight of conflict. Young men gather tires to burn to hide themselves from Israeli forces on the other side of the border in Gaza, May 15, 2018. "We can't relax. We can't sleep," she said. "I don't let my grandchildren out, because I am afraid." At the hospital about a 10-minute drive away, hallways were filled with anxious families, and every bed was taken. "He was at the border with his father when a tear gas canister hit his stomach," said Amina, standing by the hospital bed of her 15-year-old nephew, Akram Ibrahim. "We knew it would be dangerous." Barely able to talk, Akram lifted his fingers into a victory sign. After 24 hours of observation, he may be able to go home. A few doors down, Nida, a young wife pregnant with her first baby, fretted over her injured father who lay motionless with a bandaged eye and cotton clogging the blood in his nose. Her husband, brother and cousin also were in the hospital from injuries Monday. People run as a tear gas canister falls far beyond the front line of a protest in Gaza, May 15, 2018. "My father lost his eye," she said. "My brother may limp for the rest of his life." Besides protesting for the right to return to land now held by Israel, the opening of the U.S. embassy in Jerusalem on Monday particularly angered her family and many others around the world. "Right now, they are in pain," she said of her injured family members. "But they are proud of their fight for the Holy City." But pride, she explained, was not really enough. "And it would have been worth this pain if it worked," she added. "But we got nothing out of it."